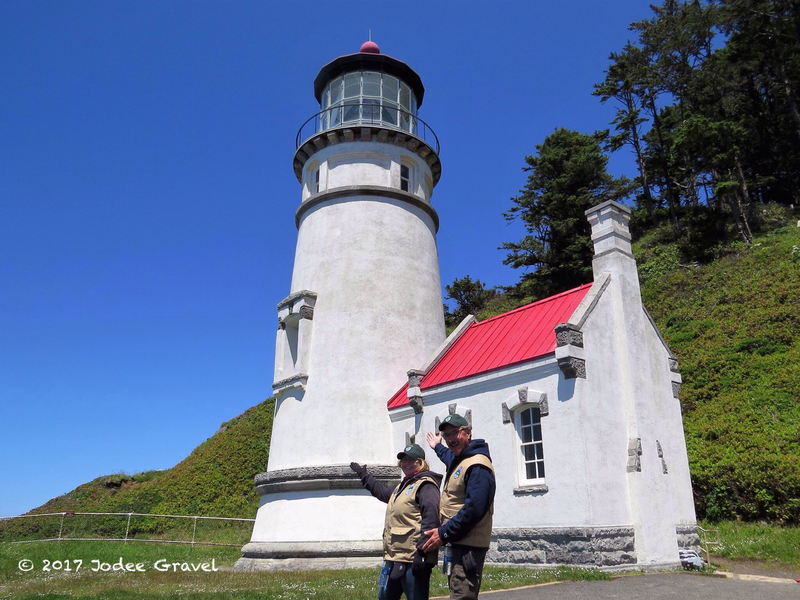 As stated in our last post, we are spending the month of June volunteering for Oregon State Parks as interpretive hosts at Heceta Head Lighthouse. 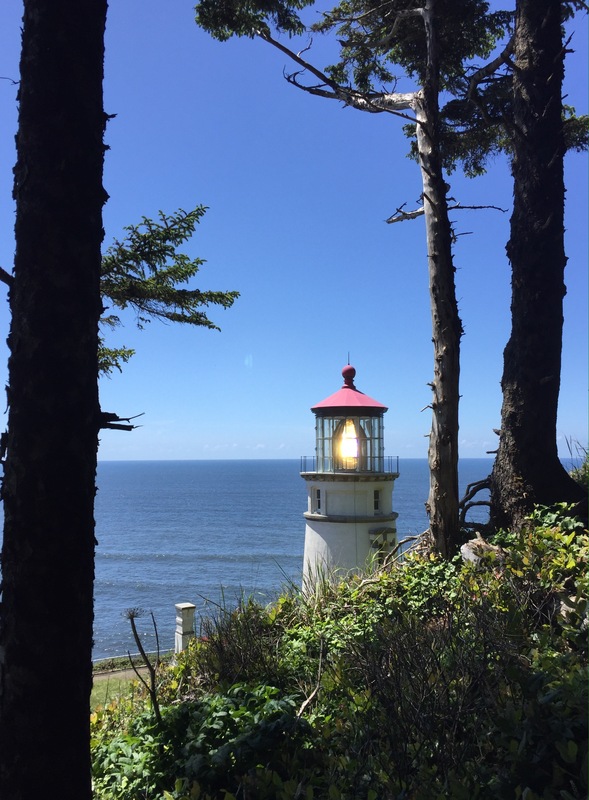 Located between Florence and Yachats, this sentinel has been guiding mariners since it was first lit on March 30, 1894. Standing at just 56 feet high, the building’s stature could be considered somewhat short. It is the commanding position on the headland that gives the lighthouse the height it needs to send its beam out 21 miles to sea. The curvature of the earth is the only thing that limits it from projecting further. The focal plane of the bullseye on the lens above mean (average) sea level is a whopping 210 feet! Back in 1775, a Portuguese explorer named Don Bruno de Heceta was sent by Spain on a mission to chart the waters from San Diego north to the Arctic Circle. When he reached the waters off of the headland where the lighthouse sits today, he noticed that there was a large shallow area several miles from the shore. That ridge of seabed became known over time as Heceta Bank, and is actually a raised area on the edge of the North American Plate. 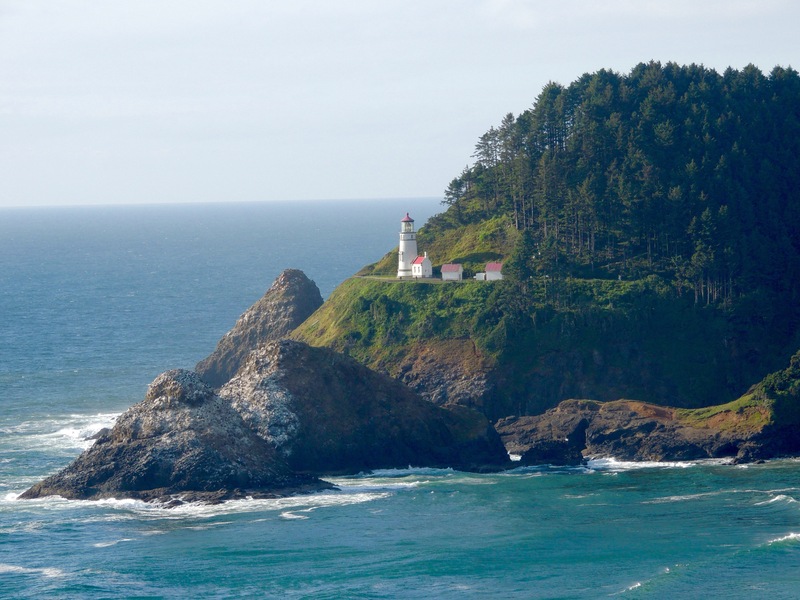 Subsequently, the headland itself became known as Heceta Head. 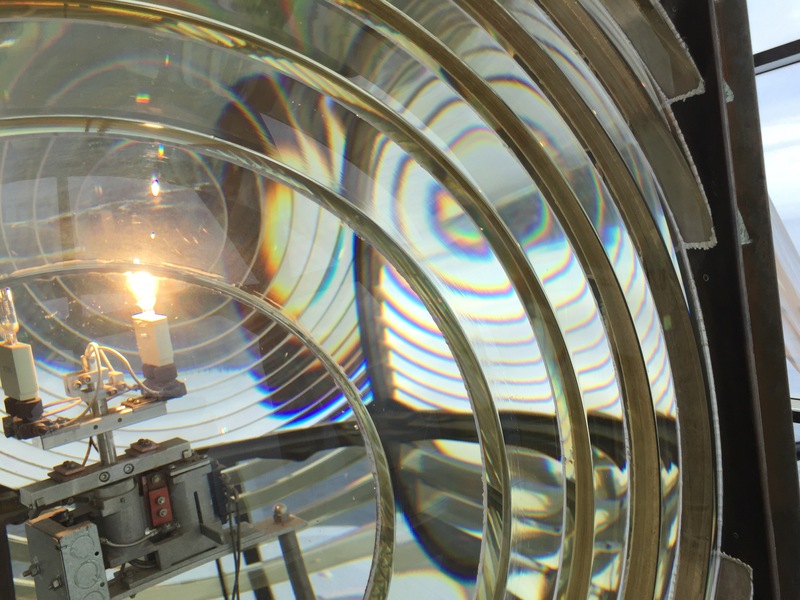 The Fresnel lens that was used at the lighthouse was made by Chance Brothers in England. Most lighthouse lenses in the United States came from France and were made out of silica based glass, which had a greenish tint to it. Chance used a sulpher based glass which gave the optic a slight yellowish hue. It was found that the Chance Brothers lenses actually had a higher candlepower, due to that color difference. At the time that Heceta Head used a kerosene lamp, the output of the lens was rated at 80,000 candlepower. When the lighthouse was first opened, the 4000 pound lens rotated one revolution every 8 minutes. There are 8 separate panels of prisms, each radiating from a bullseye in the center of each panel. As each bullseye would align between the light source and the mariner’s eyes, the entire panel would flash. As a result, Heceta’s signature was one white flash every minute. Each lighthouse has its own unique signature, so mariners are able to tell where they are at by timing the flashes. When Heceta changed from a hand wound clockwork mechanism to an electric motor, the lens speed was increased to one flash every 10 seconds. Touching on the original clockwork at the lighthouse, it was powered by a 200 pound weight that would descend from the lens to the watchroom floor. That took 39 minutes to go that distance, and resulted in the keepers having to constantly climb the steps and rewind the mechanism. A request was made to the Lighthouse Service for permission to cut holes in the watchroom, service room and first landing floors, so the weight could descend to the base of the tower. Permission was granted and the modification was completed, which increased the winding interval to 4 hours. 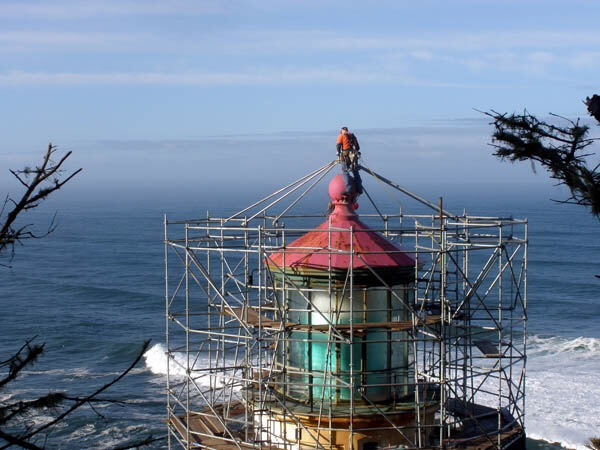 There were three keepers that worked rotating shifts to maintain the light at Heceta Head. Their responsibilities included filling the lantern with kerosene oil, winding the mechanism, polishing the lens, painting and whitewashing the buildings and general cleaning and upkeep of the lightstation. Things began to change in 1932 when the Oregon Coast Highway was built, which passed within yards of the station. Electricity came on the heels of the road in 1934, and the oil-fired lantern was replaced by an electric light bulb. That eliminated the soot on the lens from the kerosene, which resulted in less cleaning. Following that, the clockwork was removed and replaced with an electric motor. With the decreased workload, the Lighthouse Service eventually reduced the quantity of keepers from three to two. The head keeper was moved into one half of the assistant keepers duplex. The main keepers home was sold for $10 with the stipulation that the buyer must dismantle and remove it. With the onset of World War II, there were heightened concerns of Japanese attacks along the west coast. Defenses were built all along the shore from Southern California to the Canadian border. Heceta Head became host to a bevy of Coast Guard personnel, along with what was described as several vicious guard dogs. Patrols originated from the station to the north and south. A couple of barracks buildings had to be built where the former head keepers house was, and it was noted that perhaps they had removed the first structure a little too soon. Once the war was over, the barracks were removed. In 2012, a major restoration was undertaken to restore the lighthouse. Today it stands proud on the headland shining its beam through the same lens it did 123 years ago. Diana and I feel extremely fortunate to be able to showcase the beautiful sentinel this month, and to foster interest in the history of the location. We have met people from all around the globe who have come to visit the beacon. 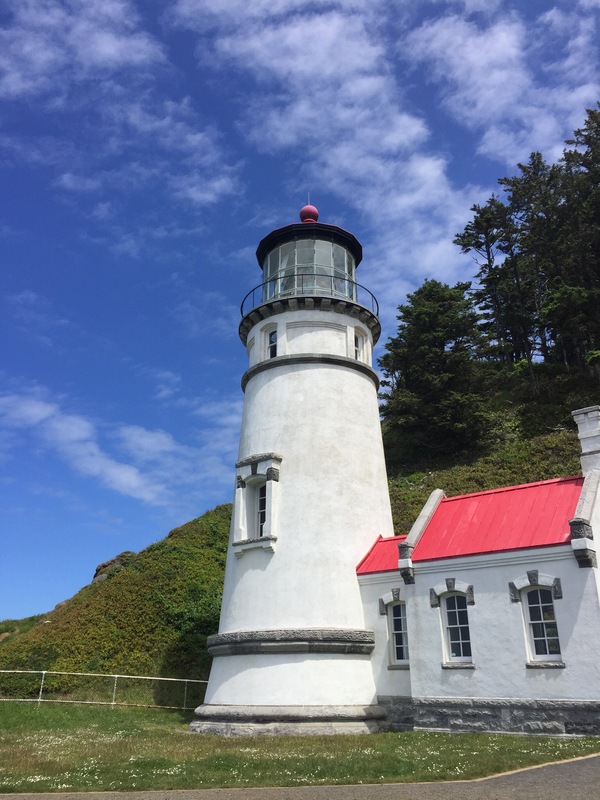 It’s that sort of curiosity and interest that ensures Heceta Head Lighthouse will still be shining brightly 123 years from now! Excellent article! As an East Coast girl and a great-granddaughter of a Keeper, lighthouses have always had a soft spot in my heart. Can’t wait to get out to visit Heceta! Enjoy your new positions, I know you’ll be awesome at it! Take care. Thanks, Kelley! What lighthouses did your great-grandpa work at? Very cool indeed! I’ve been told (I have no verification of this, other than family hand-me-down stories) that he was one of the first keepers of the small light on Bay Du Vin Island. It’s a small, uninhabited island in the middle of Miramichi Bay in Northeastern New Brunswick. The lighthouse is no longer there, having been replaced years ago with an automated channel marker. Sounds like you have the story down. Very cool gig! You can relate, I’m sure! Each tour is a little different, as the stories change in relation to e backgrounds of the people on the tour. Very fun, indeed! Thanks, Jodee! Yep…gotta keep folks (and their hats) on the flat side of the fence! I noticed I was standing by the fence on your photo of the flash on your blog post. I never tire of that view! We share a love of lighthouses! Thanks for telling the history of this beautiful light. We saw Haceta Light from the sea lion caves but did not get to tour it so I really appreciate this post. What a wonderful summer you will have as volunteers this summer. Thanks, Beth! Hope you get to see Heceta up close someday! I enjoyed your story. Thanks for writing! Great information, which I’m sure you share with those on your tours. It’s always fun to have a tour guide who is knowledgeable and informative. Sounds like you are having a blast! We certainly are, Linda! It’s a perfect job for a couple of lighthouse geeks! Excellent post! Loved reading about the lighthouse’s history. Too bad we aren’t visiting the east side of Oregon. I am sure the travelers are enjoying hearing about the lighthouse from you and Diana. Enjoy your month! Thanks, Pam! I’m loving how many people from around the world come here. Germany, Australia, Belgium…you name it! Great story, I just started following your blog, connected from Camper Chronicles when they provided a link. However I just found out that you’re working with my brother Rick there at Heceta Light. He is also enjoying his time there. Hope to do something similar when I retire in a few years. Enjoy! How cool, Jean! I just got done talking to him! He’s camped right next to us! Great post. We loved that lighthouse. We spent two weeks at Washburne SP back in 2015 and explored that area of the Oregon coast. One of my favorite places we have visited. Very cool, Shawn! The trails here are amazing! We are looking forward to giving you and Lee a tour! Love how I can always get the cliff notes version of the history of all the places you guys visit! We loved seeing that Lighthouse! I think Bill may have mentioned – he has family that were Lighthouse keepers way back when. Thanks for the great post! What a great post, you know how much I LOVE lighthouses! How do we get in on this gig? Thanks for the up date of this beautiful light house. Enjoy your time there. Interesting history of the lighthouse and area. They are always so unique. I have heard about those lens before, we have never been inside a lighthouse but I am sure we will get in one someday! If you are ever coming across the Mackinac Bridge in Michigan, go the the one on the south side. That’s Old Mackinac Point, Jim…the one my great grandfather built! Very interesting facts, I would love to have you as a guide! !